Happy May fellow crafters! I am not sure about where you live but here in Ohio there is a mad dash to plant flowers, veggies, herbs, and plants on Mother’s Day weekend. Mother’s Day weekend is when there is no danger of frost and we get to look forward to summer crops. Like a good Ohioan, I planted all sorts this weekend, including three planter boxes full of herbs. While the plastic little stakes that come with the herbs contain helpful information on them, cute they are not. I love using natural elements like wood slices, leaves, flowers, etc. 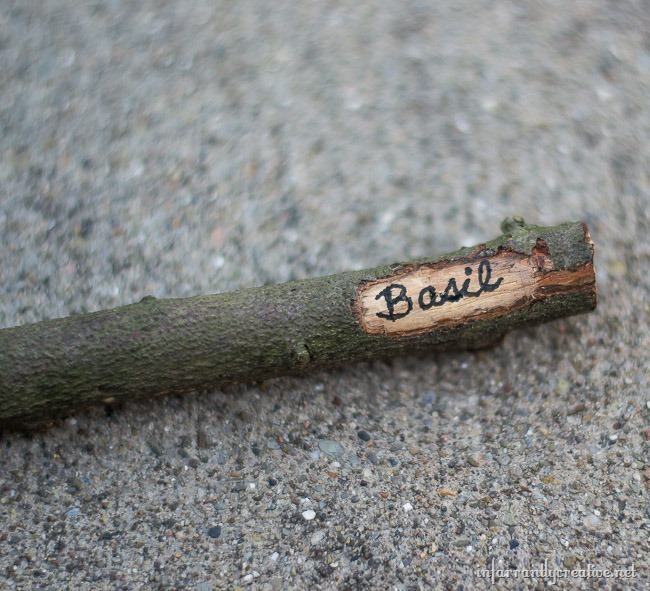 So I looked no further than my backyard to create some cute herb stakes to mark my herbs. I was a tomboy growing up. 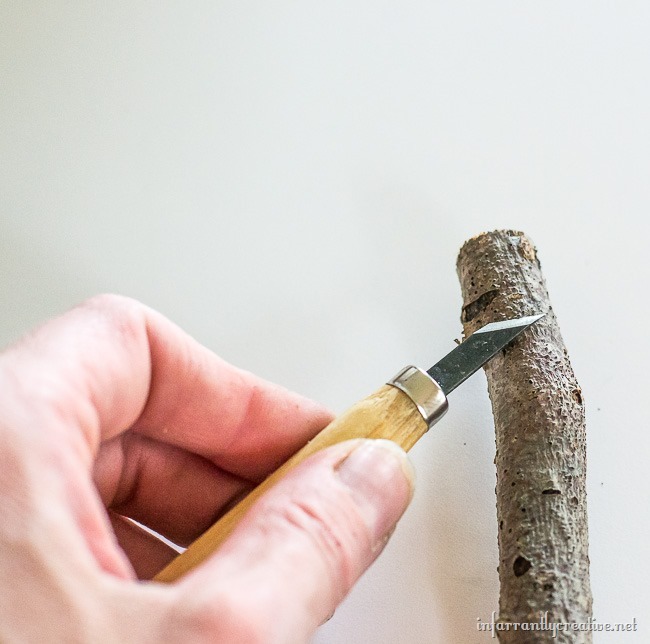 It was very common to see me with a pocket knife climbing trees, whittling sticks and carving limbs. 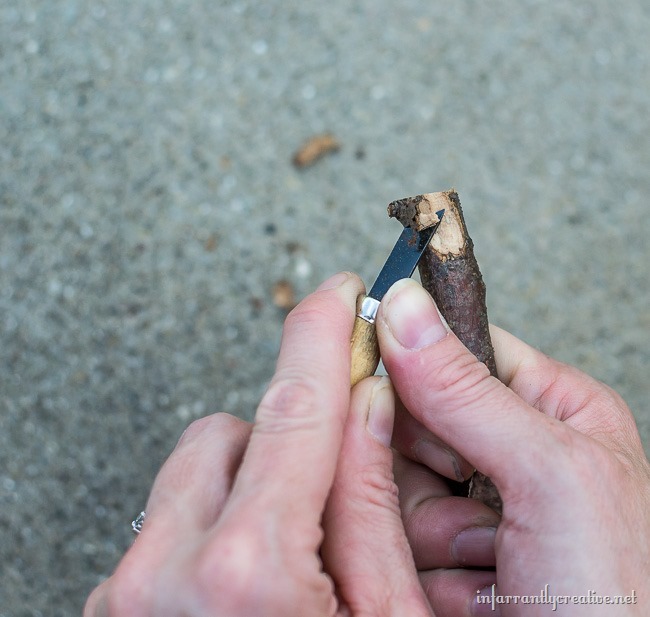 Twenty some odd years later I still love whittling and carving. However, using the right tools makes it a whole lots easier and less time consuming. Step 1. 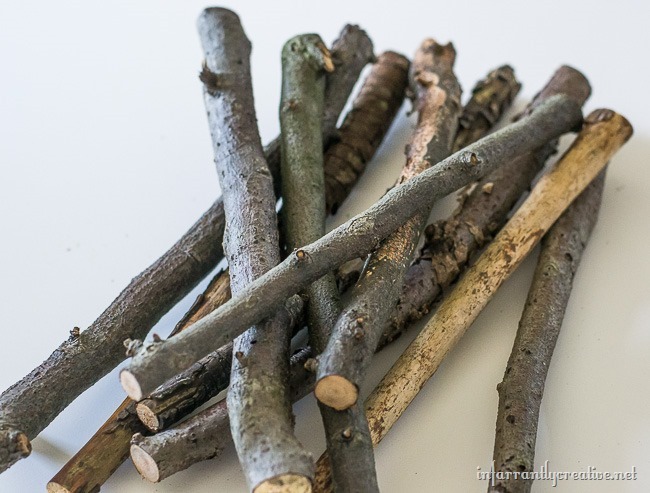 Find sticks no more than 1” in diameter and use a miter saw to cut them all about the same length. I used some pine sticks. Step 2. I started with the largest slanted blade in the packet. Keep in mind I am a leftie so you will have to adjust if you are right-handed. Bracing the stick and the knife in my left hand I used my right hand to push down on the blade with my thumb. This is almost like sharpening a pencil. 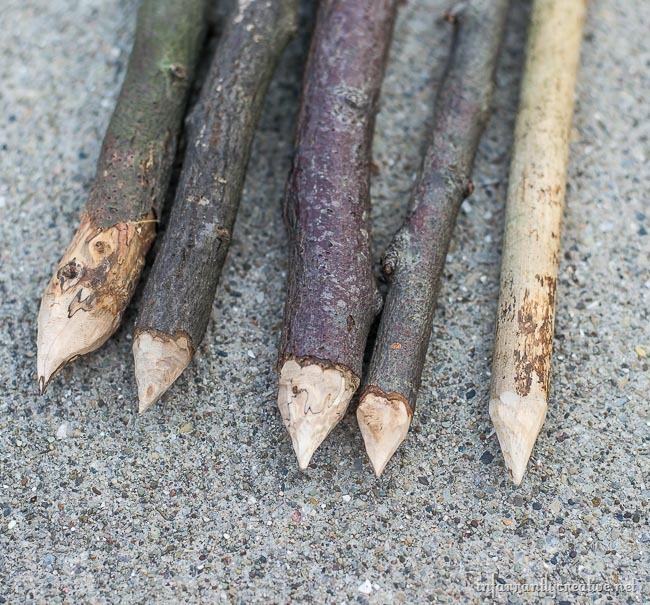 You just continue to take off more and more stick until it is shaped like a pencil point. The sharp end makes it easier to drive into the ground. Step 3. 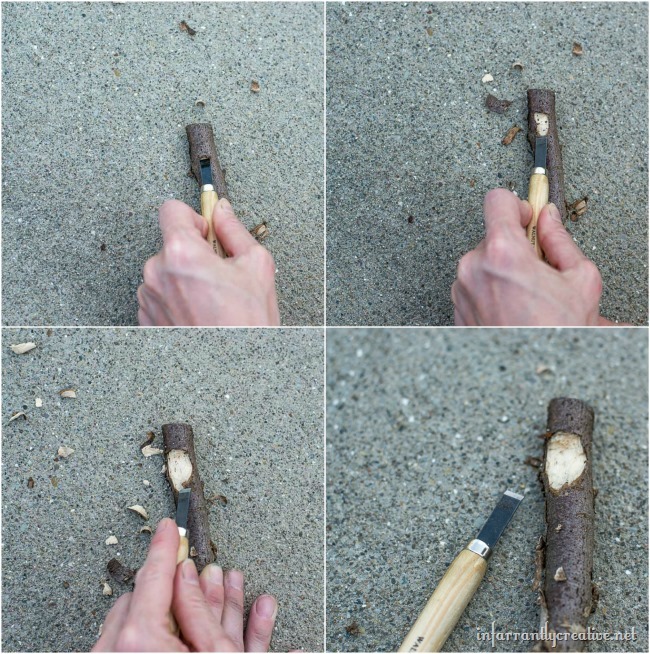 After your stake is pointy you want to take the largest flat blade and whittle away at the top of your stick to make a place for you to write the herb name on it. I positioned it as flat as I could where I could still get leverage. 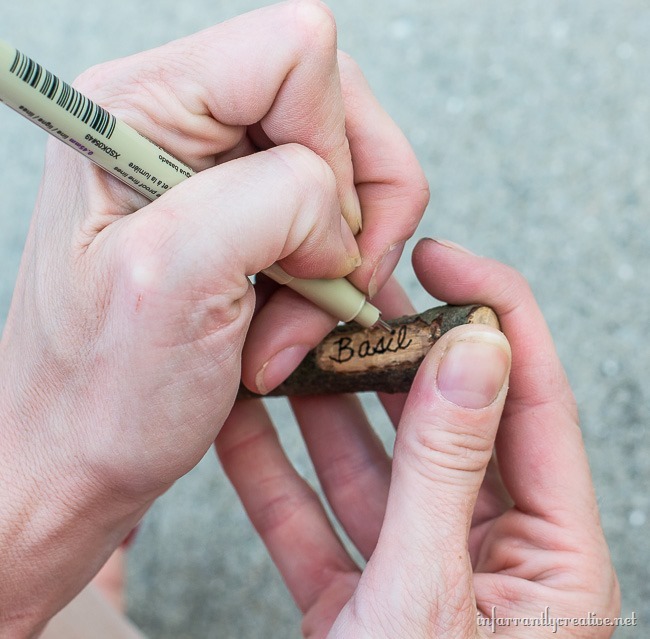 Continue whittling away until you have a nice flat spot for writing. Step 4. 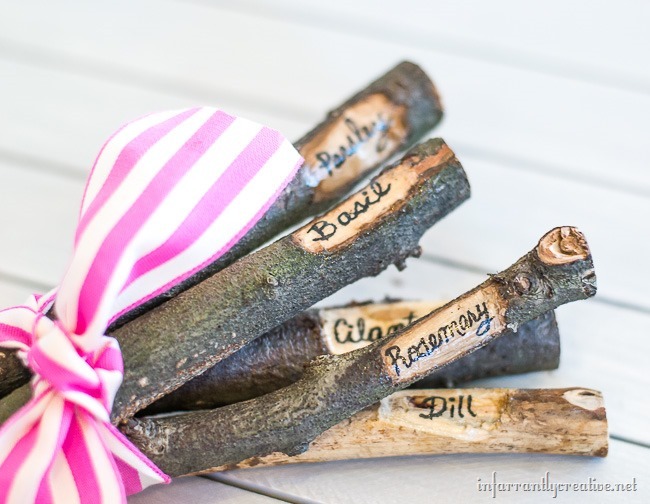 Take your fine tip sharpie or pigment pen and hand write the herb on the stick. Let it dry for a few minutes. Step 5. 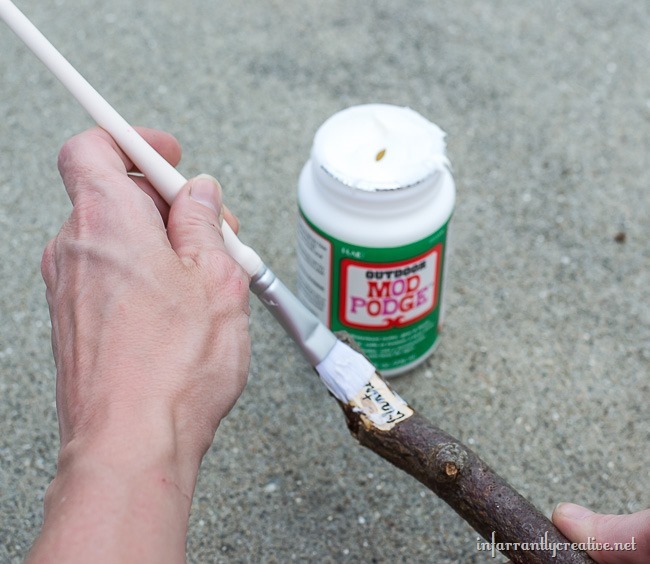 With a flat paintbrush give the area a coat of outdoor Mod Podge to seal it from the elements. Step 6. 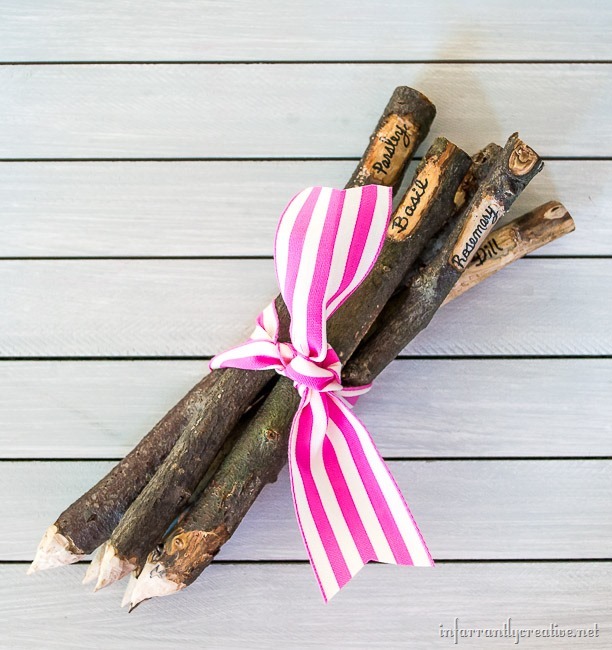 Bundle them up and tie them with a ribbon and give them to a garden loving friend. 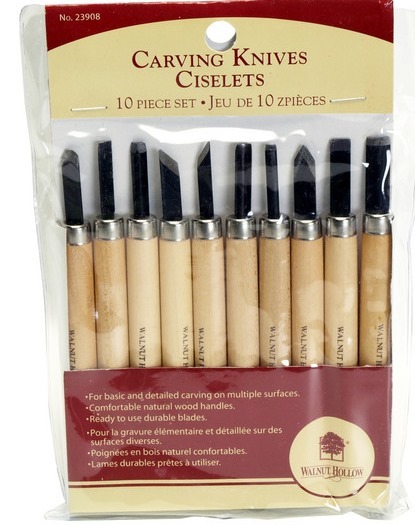 Or use them yourself and just stick them in with your herb pots. 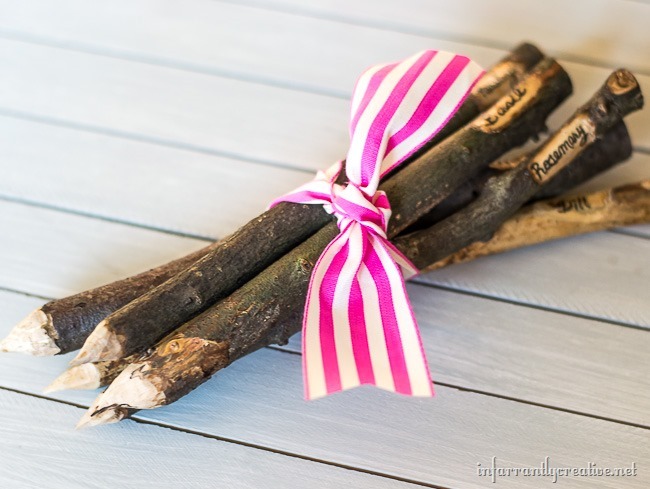 It is an easy project to do and each stick takes less than 10 minutes to make. My favorite herb to grow is basil. If you have this hardy and often unruly plant growing in your garden check out these basil recipes.